Sorcerer King is a fantasy 4X that pits you – initially weak, vulnerable and subservient – against your master, the eponymous Sorcerer King. Eventually you defeat him, stopping him from becoming a god. Well done, you’ve saved the world. 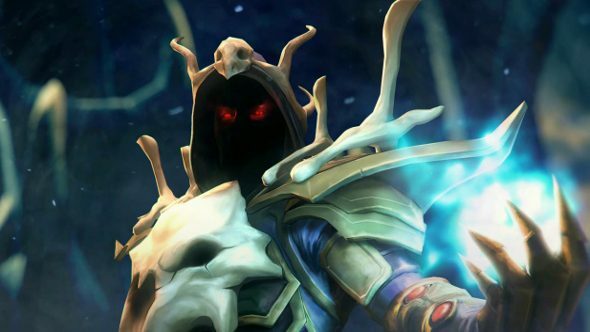 Sorcerer King: Rivals asks the question: wouldn’t you rather become a god instead? The standalone expansion, launching today, makes you the competition, fighting with ol’ SK over scraps of magic in an effort to become top dog. It’s a change in dynamic that alters both the tone and the pace of the game – though I’m not convinced for the better. The Doomsday Counter set the original’s pace, transforming it into not a race of conquest but against armageddon. It spawned a unique tension and forced you to find the sweet spot between expanding and drawing the unwanted attention of the Sorcerer King. It’s gone, replaced by a tug-of-war and wand measuring contest that ends with someone getting to be a god. Now, while that might sound like a laugh, the whole ascending to godhood thing, it’s really just window dressing for a pretty typical victory path. You’re competing with the Sorcerer King over ascension points, which you can get by casting a spell, but that requires a lot of mana. Ultimately, then, Sorcerer King: Rivals is a game about generating a hell of a lot of magic and getting a divine promotion for it. In the early game, this might inform your strategy a little, pushing you to generate more mana, but largely it follows a similar pattern to its progenitor. You’ve got to expand slowly. You’re not free to just do as you please, because the Sorcerer King has laid out some pretty specific rules, keeping the surviving kingdoms separated and not letting them get too strong. So a balance has to be struck between growth, building cities and armies, and keeping the big boss placated. 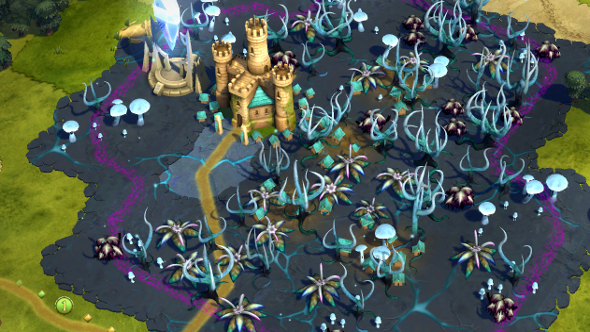 Grow too quickly, and suddenly you’ll find massively powerful armies camped out in your backyard, keeping an eye on you, perfectly able to level your cities at a moment’s notice. On the flip side, always relying on the Sorcerer King’s generosity, agreeing to his demands and generally acting in a less than heroic fashion only hastens the End of Days. All of these obstacles and limitations make expansion difficult, but when expansion is often a matter of going through the motions, a system that forces you to turn off auto-pilot and make a multitude of risky decisions is extremely welcome. Doom Canyon, that’s what I called it. It was more of a valley, really, but Doom Valley sounds like a Welsh police procedural. 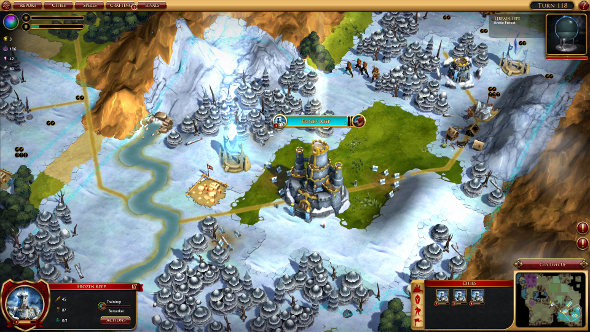 A long road ran through it, flanked by bandit camps and patrolled by monsters. On the other side, fertile farmland beckoned, and metal, clay, and a magic-generating shard. Finally, it was also a shortcut to the heart of the Sorcerer King’s domain. I needed to tame it. I threw a lot of bodies in there. It wasn’t always called Doom Canyon. It became clear that I’d need bigger armies. More resources. The more obsessed I became with the canyon, the more strained my relationship became with the Sorcerer King. He asserted that my many armed men and new outposts made me seem most unchill. I flipped it round on him, explaining that it was he who was acting unchill. Our friendship was broken. And by the time I finally carved my way through that bloody canyon, the exit was pretty much surrounded. A dragon showed up. The next couple of battles went… poorly. Things can fall apart swiftly. The Sorcerer King is a sensitive fellow and prone to temper tantrums, and for most of the game he’s so much more powerful than you – stupidly so – that going toe-to-toe with him amounts to throwing yourself into a volcano with only factor 15 on. The game encourages risk-taking, because it’s the only way to make meaningful progress and increase your power, but makes taking those risks a terrifying prospect. All of this is true of both games, but Rivals loses a lot of tension from the lack of the Doomsday Counter. 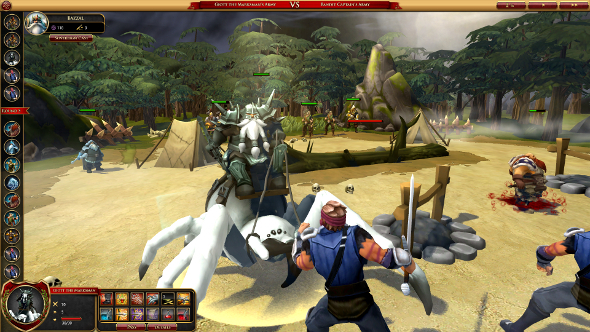 The end goal of the original game was to conquer or unify the disparate kingdoms, raise an army and stop the Sorcerer King from achieving his seemingly inevitable objective. It was a desperate race, and there was a clear goal and a clear threat. Things get a bit murkier in Rivals. See, the Sorcerer King is going around destroying shards and gaining ascension points, and once 500 points have been generated, the time of ascension arrives and the Sorcerer King or his rival has to control two thirds of them to become a god. It’s not all that obvious at first how you go about that, but it’s actually as simple as clicking on your spellbook. It’s a bit perfunctory. All you have to do to generate the points is keep casting a spell that costs a big chunk of mana – a little bit less dramatic than starting a revolution. And then when the time of ascension kicks off, generating mana draws all the focus. The Sorcerer King, on the other hand, gets points for killing your heroes and smashing shards, letting the AI be more proactive than the player. There isn’t much in the way of a climax, either. Instead of destroying your nemesis and conquering the world, you’re just hoarding a resource. Well done for being frugal, I guess? Neutral (but rarely for long) factions do sometimes throw a spanner in the works and keep the end game from being exclusively about filling your pockets with mana, at least. They’re basically you from the first game, valiantly rising up against a tyrant intent on becoming a god. Or maybe they’re just jealous. But they can also be calmed down and even befriended, making them a potential bulwark against the Sorcerer King’s forces. A new campaign better tailored to the ascension system could have possibly framed it better, though two new playable non-human factions and new quests do beg investigation in custom games or the original campaign. Both the undead and Dwarf factions change the areas they settle, corrupting or freezing them, respectively, and their units are distinct from the human factions and come with their fair share of tide-turning abilities. Unfortunately, arachnophobia might have coloured me against them. 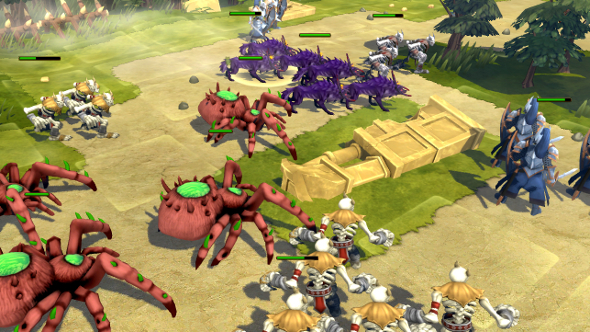 Both factions have a peculiar love of giant eight-legged beasties, and it’s just not on. In both the strategy and tactics layer, the new factions work a bit differently. The Dwarven King, for instance, can cover areas in snow and ice, buffing his stumpy armies in the process, while the Grand Lich’s forces can be bolstered by raised undead and dark magic by spending bone fragments gathered from fights. Playing as the Grand Lich felt particularly appropriate, given the less than heroic tone of the expansion. Though that’s not to say that you can’t be a benevolent leader attempting to become a god for the good of everyone. It’s not exactly a humble aspiration though. Despite the pace issues and the absence of a new campaign, I enjoyed facing off against the loopy Sorcerer King for another couple of rounds. Though much of what kept me sticking around, turn after turn, was the juxtaposition of servitude and rebellion, and the constant struggle to make bold plans and keep pushing forward all the while keeping the head honcho off my back. And all of that can be found in Sorcerer King.